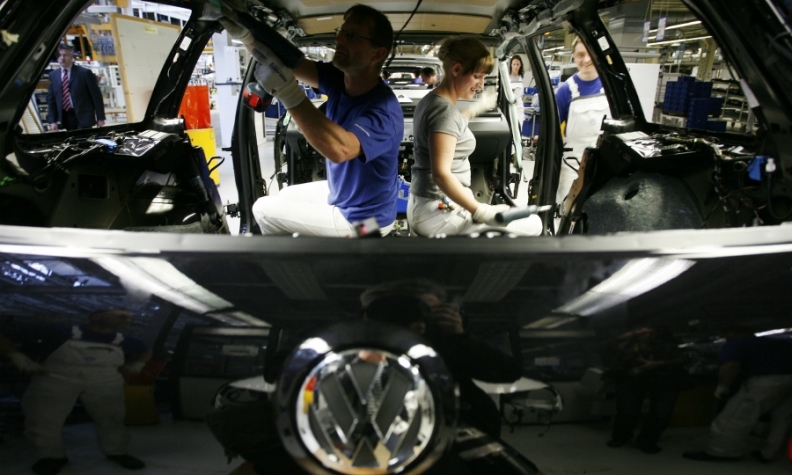 VW workers construct a Passat at the automaker's Emden plant in Germany. WOLFSBURG -- Volkswagen hopes to finalize plans this year to reduce its German workforce by a net 14,000 workers by the end of the decade without using to costly severance packages, as the brand seeks to save 3 billion euros in domestic labor costs to help offset the costs of its diesel scandal. VW personnel chief Karlheinz Blessing said: "Based on our assumptions for natural fluctuation, we are still missing another 2,200 to really be in the target area." When asked whether he expected this number of employees to sign ATZ early retirement deals by the end of this year, he said: "That's the goal, to check this off the list as much as possible." As part of its so-called "Future Pact" designed to boost productivity by 25 percent over four years, the VW brand is eliminating 23,000 jobs by 2020 in Germany. Simultaneously, however, it plans to add 9,000 employees in new technological fields such as digitalization and electromobility. As part of a deal with its powerful labor unions, the overwhelming bulk of that increase will be filled by people whose current jobs are being phased out, translating to a net reduction of 14,000. At the end of the program, that will leave just over 100,000 people still employed by the brand in Germany. Blessing said VW could cut more jobs if necessary to achieve productivity targets "using the tools at our disposal." "Severance packages are the absolute last resort and would only be offered on a case-by-case basis," Blessing said. "There was a big severance package campaign at VW in 2006 and typically what happens under the required 'Social Plan' is that you have those people that have the best chances of getting hired elsewhere leave, while those stay whose chances in the job market are poor." "The world doesn't end with the Future Pact, though" Blessing said. Mastering the shift to electromobility with its reduced complexity and fewer hours per vehicle would prove a challenge. "We don't know at present how many new jobs might be created through digitalization and mobility services but assuming the overall number of cars sold in Europe doesn't substantially grow, then you can imagine we will have an issue in the future," he said. "Thankfully we have a bit of time to shape this process, and that is one of the most valuable aspects about the Future Pact."